Today is the day for The Secret Recipe Club. This month I was assigned Bewitching Kitchen written by Sally. Sally was born and raised in Brazil. She currently resides in Manhattan. She goes by Julia Child's advice "Everything in moderation, including moderation". She loves to exercise, jog and play golf. I really liked how at the end of every post, Sally gives her honest opinion about how she felt about the recipe. She has a huge collection of recipes on her blog. So big that narrowing it down to one recipe was hard. Her recipe collection includes a number of Brazilian recipes that I hope to try soon. While I was browsing Sally's blog, my husband mentioned if I could make biscotti so away I went to search on Sally's blog. I came across her recipe for Maple Walnut Biscotti. From what I have read, there are 2 types of biscotti, the traditional Italian ones that are very hard and the North American style that are more like a cookie. I found these to be similar to traditional Italian biscotti. A hot cup of coffee or tea is essential for dunking! My kids didn't try these since they were quite hard. They were a great accompaniment to an afternoon cup of tea. I didn't nake the maple icing as I found them to be very sweet. But I'm sure it would have been a great addition. I made half the recipe and reduced the sugar slightly. By accident, I put 1 1/2 tsp of maple extract instead of 1 1/2 tbsp and this made the dough a little harder to form. I really wish I hadn't made this mistake because I didn't get the maple flavour I was looking forward to. Guess that's just an excuse to make these again! My husband loved them and the big crunch they had. Some of Sally's other recipes I plan on trying soon are Zucchini Fritters with Feta and Dill, Torta Di Zucchini, Roasted Lemon Vinaigrette and Pea Pancakes with Herbed Yogurt. Please head over to Sally's blog to try one of her many recipes! Preheat oven to 350°F. Line a baking sheet with parchment paper. On a separate baking sheet place walnuts and place in oven for 10 minutes to lightly toast. Coarsely chop on a cutting board. In a large bowl, mix together toasted walnuts, sugars, cinnamon, baking powder, salt and flour. In a small bowl, whisk egg. Add the maple extract and whisk. Add to flour and stir together. With lightly floured hands, keep squeezing the dough until it comes together. Divide into 2 pieces. On a lightly floured surface, shape each piece into an 8x2 inch log that is 3/4 inches high. Transfer to parchment lined baking sheet. Bake for 40 minutes, rotating pans halfway through. Cool on a rack for 20 minutes. Using a serrated knife, cut 3/4 inch logs on a slight diagonal. Place cut side down on baking sheet. Turn the oven off and place the cookies in the warm oven for 30-60 minutes, depending on how hard you would like them. Awesome post! I am away on a trip and time is super limited for connections, but I wanted to say hi! Happy Reveal Day, and thanks for the great write up! I am obsessed with biscotti! Your maple walnut version looks delish! Isn't Sally's blog amazing? That shot of the biscotti and the coffee is gorgeous, and I am coveting your China! I love traditional crunchy biscotti! And I love the maple walnut comb, sounds delish! OH this is a lovely recipe. I bet the flavor of the maple is spectacular in these biscotti! Sounds delicious :) Awesome pick this month! Visiting from Group C to say that these maple biscotti look absolutely delicious. They sound like a wonderful, different treat with coffee. Wonderful SRC post. These sound lovely! 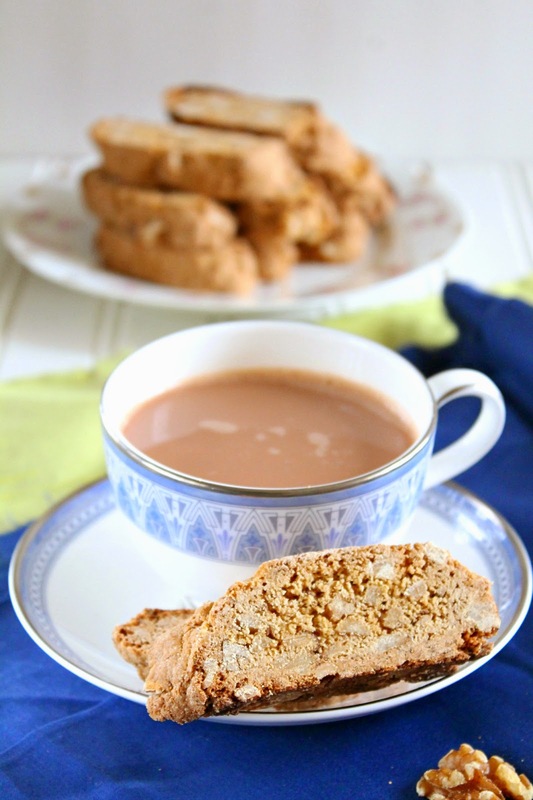 I love the crunch of biscotti, especially if I have a cup of tea or coffee to accompany it. Great choice for the SRC! Yum, love maple-walnut as a flavour combo, and it's pretty hard to go past a biscotti to dunk in a great cup of coffee. You had me at maple walnut! These look amazing! Its maple season and I cannot wait to try this recipe with our homemade maple syrup. Great pick!! I knew this recipe looked familiar! I hosted the virtual shower that Sally originally made the biscotti for! I really need to give them a try - I even have a big bag of walnuts sitting on my counter. Great pick this month and beautiful photography. Biscotti are a fabulous pick! I just love them and love Sally's blog too! !